Kyle Grillot - kgrillot@shawmedia.com During his first trip back to Dundee-Crown High School, Jay Cramer, class of ’93 Dundee-Crown graduate and former co-captain of the football team is greeted by his freshman football coach Bob Skillman. In 2005, Cramer suffered a broken neck while training as a semi-finalist on Survivor, and is now a Comedian out of Los Angeles. Cramer and his wife Katy Sullivan came back to Dundee-Crown to speak to thousands of students about overcoming personal challenges. Kyle Grillot - kgrillot@shawmedia.com During his first trip back to Dundee-Crown High School, Jay Cramer (center left), class of ’93 Dundee-Crown graduate and former co-captain of the football team, is greeted by the mother of the other co-captain history teacher Jo Helminksi (left). In 2005, Cramer suffered a broken neck while training as a semi-finalist on Survivor, and is now a Comedian out of Los Angeles. 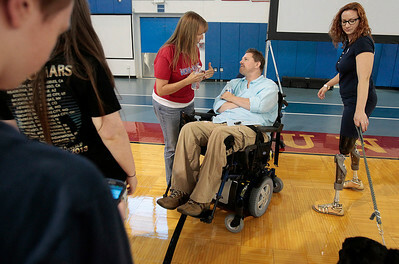 Cramer and his wife Katy Sullivan came back to Dundee-Crown to speak to thousands of students about overcoming personal challenges. 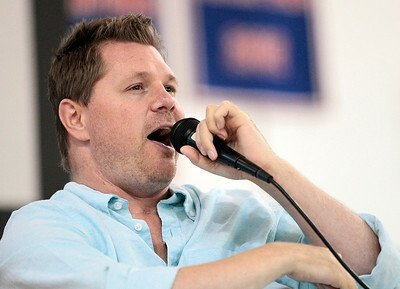 Kyle Grillot - kgrillot@shawmedia.com During his first trip back to Dundee-Crown High School, Jay Cramer, class of ’93 Dundee-Crown graduate and former co-captain of the football team speaks to thousands of students about overcoming personal challenges. In 2005, Cramer suffered a broken neck while training as a semi-finalist on Survivor, and is now a Comedian out of Los Angeles. Kyle Grillot - kgrillot@shawmedia.com Student cheer on Jay Cramer's wife Katy Sullivan while she speaks about her struggles with acting and athleticism at Dundee-Crown High School Friday, August 23, 2013. 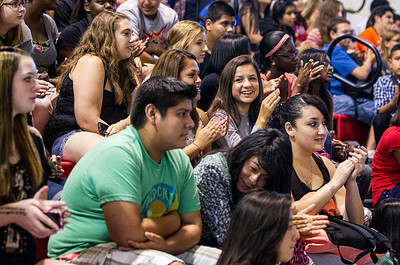 Sullivan came back with her husband to speak to thousands of students about overcoming personal challenges. During his first trip back to Dundee-Crown High School, Jay Cramer (center left), class of ’93 Dundee-Crown graduate and former co-captain of the football team, is greeted by the mother of the other co-captain history teacher Jo Helminksi (left). In 2005, Cramer suffered a broken neck while training as a semi-finalist on Survivor, and is now a Comedian out of Los Angeles. 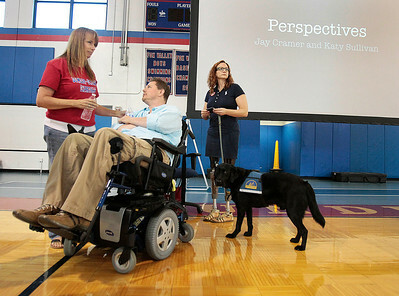 Cramer and his wife Katy Sullivan came back to Dundee-Crown to speak to thousands of students about overcoming personal challenges.